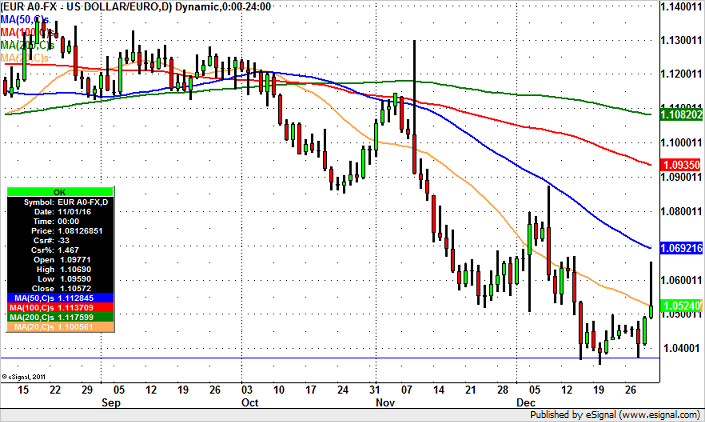 EUR/USD had a great run this past week but the sell-off on Friday screams of a deeper reversal. Technically, the rally stopped just short of the 100 and 200-month simple moving averages near 1.2550. These are significant resistance levels that would be the perfect points for reversal. 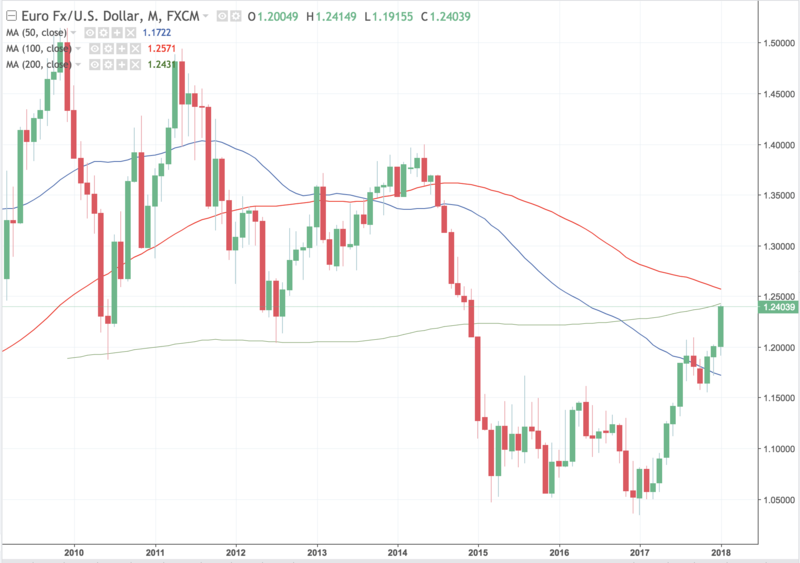 Technically, we see reasons for a near term recovery in the U.S. dollar but fundamentally there are plenty of reasons supporting the euro’s rise. The latest Eurozone economic reports show ongoing strength in the Eurozone economy. The European Central Bank is optimistic with members like Benoit Coeure saying the central bank will discuss changes to the policy language in early 2018. There’s no doubt that the positive momentum in the economy has ECB officials thinking about normalizing monetary policy and they could make the move as early as next month. This would be irrespective of how next week’s economic reports fare. EUR/USD will be in focus with a number of market moving data scheduled for release including the ZEW survey, February PMIs and the German IFO report. So even if EUR/USD dips, we expect buyers between 1.2250 and 1.2375. Will ECB Stop EURO from Hitting 1.25? Thursday’s European Central Bank monetary policy announcement is the most important event risk this week. The euro is trading strongly ahead of the rate decision despite the risk of ECB President Draghi jawboning the currency. 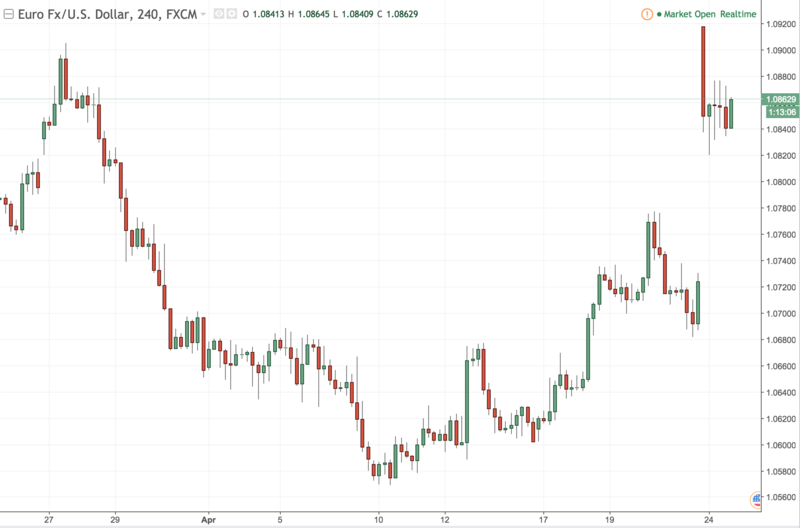 Since their last meeting in December, EUR/USD is up close to 5% and while a number of ECB officials have come out speaking against the currency’s rise, investors are waiting on Draghi. The problem is that we’re not sure he’ll say enough to halt the currency’s gains. Its important to realize that the euro is rising under the backdrop of a weaker dollar, hope for early guidance change a and stronger Eurozone growth. In order for traders to stop buying euros and start selling, Draghi needs to unambiguously dovish. That means expressing currency concerns and downplaying the chance of a guidance change. He can accomplish that by saying rate hikes won’t come until after QE ends and that the market misinterpreted the ECB minutes. In this case, EUR/USD will fall with profit taking possibly driving the pair below 1.23. However if Draghi expresses concerns about the currency but focuses on the improvements in the economy and acknowledges the possibility of early guidance changes, buyers will sweep in quickly especially following knee jerk decline and we may find EUR/USD on its way towards 1.25 because the trend is on the side of the currency. Technically, there are 2 key resistance levels about the current one, the 200-day SMA near 1.2430 and then 1.25. It’s been an extraordinarily quiet week for the EURUSD which has been trapped in 50 point range for with little movement in the past few days. The market appears to be in equilibrium as traders await the next batch of data next week that could provide some light on relative growth prospects of both US and EZ. Meanwhile, tomorrow’s EZ Flash PMIs often serve as the earliest indications of conditions on the ground. Markets anticipate a slight decline perhaps tempered by a pullback in French data. However, if the data surprises to the upside it could provide a much-needed lift to euro bulls and shake the currency out of its stupor as it would suggest that growth in EZ region is actually accelerating which may force the ECB to curb QE faster. Technically the pair remains in a 1.1000 -1.1300 corridor, but a break above 1.1200 would provide it with an upward bias and possible move all the way towards 1.1500. 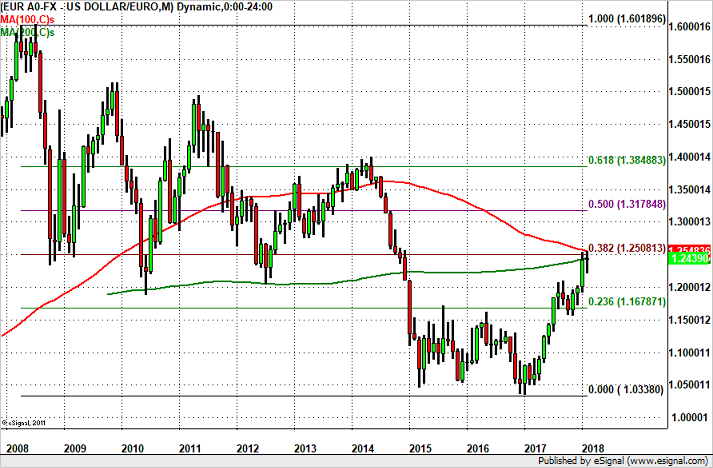 EURO – Where to Sell? 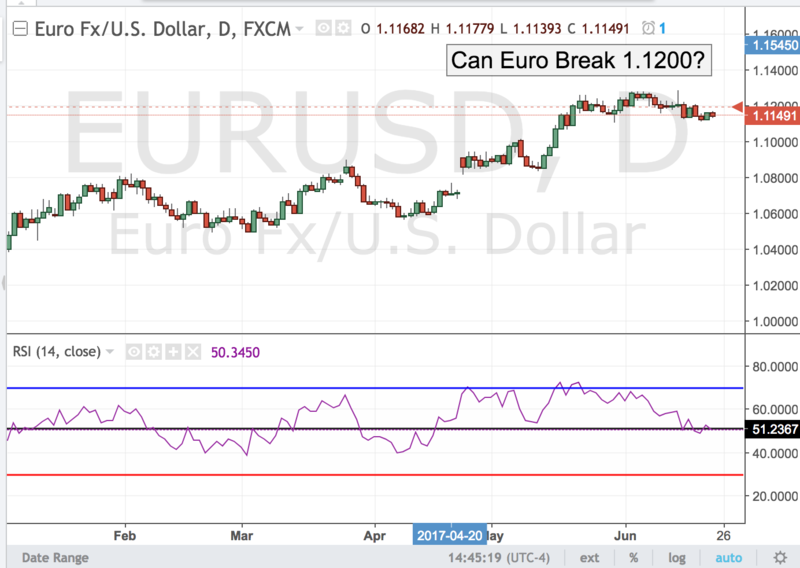 While EUR/USD rebounded just a few pips shy of 1.05 the last week of December the New Year starts with investors still wondering if the currency pair will hit parity. In a broader context, we are actually pretty close to that level and a move down to that rate hinges less on European developments than U.S. ones. 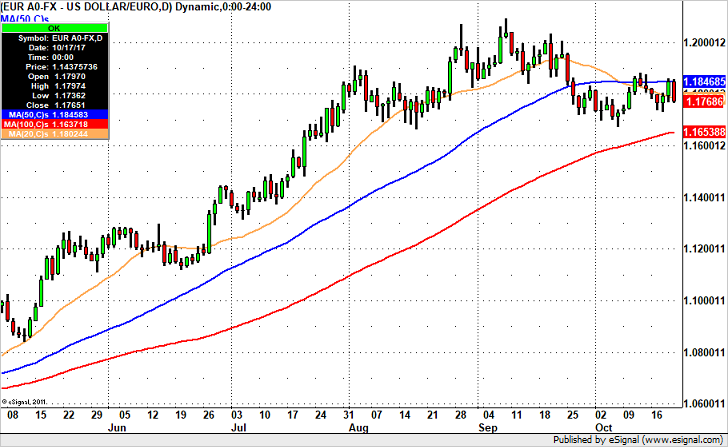 If the U.S. dollar continues to strengthen, the euro will continue to weaken. The Eurozone has its own troubles but as weak as the euro may be, the slide in the currency is changing the outlook for inflation and growth. In the recent ECB economic bulletin, the central bank said they see inflation picking up strongly at the turn of the year, a view that the Bank of England shares. We’ll likely see this view repeated in the ECB’s account of their last monetary policy meeting, which is due for release next week. Data should also be relatively healthy with sentiment up and job growth growing, albeit at a slightly slower pace. The ECB’s easy monetary policy is paying dividends but Europe’s problems extend beyond day to day business activity. The greatest risk for the Eurozone and the euro next year are politics, terrorism, elections and a banking crisis in Italy. Many of these events are difficult to handicap but each of these scenarios could have a dramatic impact on the currency overshadowing positive improvements in the economy. Looking ahead we hope to sell rallies in the EUR/USD between 1.06 and 1.07 targeting a move to 1.01 or lower. Technically now that the 1.05 level has been broken the next “main area” to sell EUR/USD will be at the 50-day SMA below 1.07. 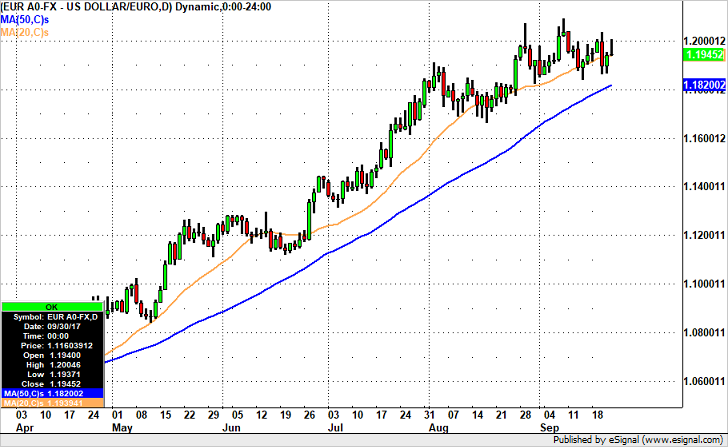 EUR/USD may not get that high so anywhere on the 1.06 handle may be a good place to scale in shorts. The focus however remains on 1.05. If the currency pair falls back below 1.0500, we should see the pair drop back to its December low which coincides with the 1997 low near 1.0350. If EUR/USD breaks above 1.07, then the next stop will be 1.09.